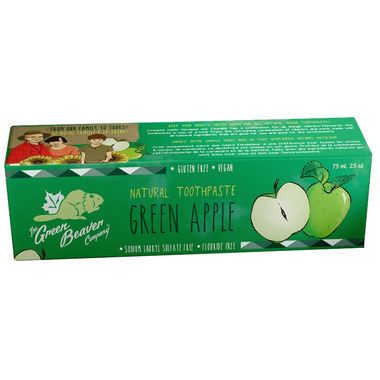 Green Beaver's natural toothpastes are made with plants & minerals. Unlike toothpaste with fluoride, children under the age of 6 years of age can safely swallow this natural toothpastes (including toddlers). Furthermore, Green Beaver's toothpastes are made with real flavours without any chemically engineered synthetic flavours (or dyes), making it better for you and the environment! The toothpastes contain natural antibacterial agents such as Xylitol, lemon and tea tree extracts. Xylitol occurs naturally in fruits and vegetables, including berries, apples, and plums. According to Health Canada, "studies have indicated that xylitol in particular may actually help to prevent tooth decay". It also contains natural mineral whiteners such as Silica and calcium carbonate, natural breath fresheners like aromatic and refreshing herbs. They also add Calcium ascorbate, which contributes to the normal development and maintenance of teeth and gums. Available in five natural flavours from Mother Nature’s garden: Frosty Mint, Star Anise, Zesty Orange, Green Apple, and Cilantro Mint. Smile naturally and naturally smile with natural oral care. Find more ways to start a natural oral care routine on our blog, The Well! Ingredients: Calcium carbonate, sorbitol, water, glycerin, hydrated silica, pyrus malus (Apple Juice), Xylitol, Citrus Grandis (Grapefruit) seed extract, aroma/ flavour (natural apple), Citrus Medica Limonum (Lemon) extract, xanthan gum, coco-glucoside, calcium ascorbate, melaleuca alternifolia (Tea Tree) leaf oil. Does not contain: Paraben or hydantoin preservatives, sulfate detergents, artificial aromas, fragrances or dyes, phthalates, quaternium, EDTA, propylene glycol or petrolatum, Fluoride, artificial flavours or aromas, dyes, sodium lauryl sulfate (SLS), chemical whiteners, propylene glycol, preservatives. Bought this for my kids, however they weren't very fond of the taste of it. I also bought a mint one for myself and wasn't a huge fan of it either. Have bought this toothpaste for years for my kids, only one I will buy. My child loves this toothpaste. This probably wouldâ€™ve been ok if youâ€™re already used to organic toothpaste but for our family whoâ€™ve been used to mint and flouride, this was a fail as a starter toothpaste to transition to. My 6 year old didnâ€™t like and I myself am having a hard time trying to get used to it. Maybe Iâ€™ll try the mint flavor. My daughter loves the flavors of these. I like thenecause theyre are the cosest to natural we can get without carageenen and other harmful products. I just wish they were a little thicker. Use it for my kids, they love it! None of the Big Brnad names offer natural toothpaste let alone a cruelty free alternative. I love this stuff & the apple is my favourite flavour! Kids love it. Itâ€™s a winner at our house. My toddler loves this toothpaste. It's one of the reasons I don't bother shopping at my local Shopper's Drugmart anymore. If they don't carry Green Beaver toothpaste, and a few other products we love, what's the point in making the trip? It's that good, and the price is right at Well.ca. My husband has severe oral lichen planus and this is the only toothpaste he is able to use that doesn't burn his gums and tongue. My 2 year old loves it. He's excited to brush his teeth with it. My 2 year old daughter LOVES this toothpaste. It makes brushing her teeth so much easier. I am so happy I came across this toothpaste. My four year old daughter hates toothpaste. I mean full melt down, tears and screaming. I've tried many different kinds for many different years. Fast forward to this toothpaste. Game changer! Not only for her but for my entire family of six. The minute I got it in the mail and realized she liked it I was back on here ordering more for back up. I plan on keeping this toothpaste fully stocked in my house. I also got the orange. I will be a long time green beaver customer now! Thank you! This is my 6yo sons favorite toothpaste. I like that it is fluoride free, but I would prefer it if it didn't have glycerin either. Love this product. Kids love it too. Favourite flavour among all the other flavours! Love the ingredients, and the flavour is a favourite of both the kids and adults in this house! Nice product for the whole family. Would buy again. My kids love this. It does have a good, real apple flavour. I like the lemon earthpaste kind better for myself. Love this product for my kids! As a parent I love this toothpaste, because it's safe for my small children and fluoride free. I'm not scared of them swallowing it if it happens when they're learning. It also has just mild natural flavoring, so they don't get the wrong idea it's a treat/candy of some kind! (Major problem with most kids' toothpastes.) My children also love it as it's something sweet instead of minty! I love Green Beaver products. The only reason I gave this item 4 out of 5 stars is I don't care for the apple flavour. I will probably order the mint flavour next time. The only toothpaste my picky 4 year old will use. She likes it because it's not "spicy" , i like it because of the Ingredients! My daughter loves it also I love too. Love this toothpaste. We use it for our toddler and he loves the taste of it, maybe a little too much, and we feel reassured that there is no fluoride in it. My kids (2 & 6) love this toothpaste! Knowing it doesn't contain harmful chemicals also gives me a peace of mind. Good for young kids when they don't like mint. My kids love it!!! Makes brushing teeth fun for kids. I prefer a minty toothpaste but the apple is a huge hit with both my kids and my husband!! My daughter refuses to use toothpaste with a mint flavor as she says it's too spicy. She really likes the green apple flavor of this toothpaste though. My 5 year old daughter loves this toothpaste more than any other. Les enfants n'aiment pas le dentifrice qui pique dans la bouche. Celui-ci ils l'adorent! This toothpaste is great! Cleans very well and kids love the taste! This toothpaste is fantastic! Taste is wonderful and i love the all natural ingredients. I only wish I had found this sooner. Disliking mint is highly inconvenient when it comes to toothpaste, and I now know I suffered needlessly through years of gagging and displeasure without realizing there were other options outside of the various intensities of mint chemical toothpaste. Would highly recommend to any parent whose child balks at brushing their teeth. Ma fille de 2 ans fait des allergies. Nous avons essayÃ© plusieurs dentifrices. C'est le seul dentifrice auquel elle ne fait aucune rÃ©action! Elle l'aime beaucoup. On l'utilise depuis qu'elle a un an. Tastes good and it's safe for kids. This is my kids favourite toothpaste! And as a parent I love it too! It cleans their teeth very well and has no toxic ingredients that I have to worry about! My 3 year old sometimes swallows the toothpaste so making sure it has clean ingredients is very important to me. I like Green Beaver products in general, and this toothpaste is no exception. My 4yo loves the taste too. A perfect choice for my daughter who can't spit, and actually likes to lick the toothpaste off her toothbrush!